Sd.Kfz.131 Panzerjäger II für PaK 40/2 "Marder II" Early Production. Early in the war there was an urgent need for self-propelled anti-tank platforms, especially when the Wehrmacht was confronted by well-armored enemy vehicles such as the T-34 and KV-I during the invasion of Russia. Many hybrid designs were converted from obsolete tank chassis. 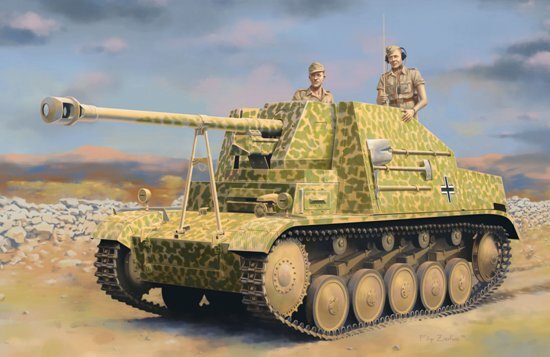 The Marder II was a case in point, as it was based on a Panzer II chassis. The Mid-Production version of the Marder II (Sd.Kfz.131) was armed with 7.5cm PaK 40. Some 576 Marder IIs were produced from June 1942 till June 1943, and they fought primarily on the Eastern Front. Dragon’s new 1/35 scale kit is a superb rendition of a Early-Production variant, and it perfectly complements the Marder II family in Dragon line-up. New tooling for this kit include the spare track rack, upper hull, vision port on starboard side and the ammo lockers. Cartograf decal are included.